"Great news to all EXCITER fans worldwide: myself and original [EXCITER] members Dan Beehler [drums, vocals] and Allan Johnson [bass] have officially reunited! We intend [on] performing our bone-crushing, neck-snapping speed metal in as many countries that will have us! "To celebrate our long-anticipated reunion, our first confirmed gig will be at the Keep It True festival in Lauda-Konigshofen, Germany, April 24, 2015. We hope to see you there! Our performance will consist of all the classics that established EXCITER as one of the pioneers of speed and thrash. New material and a new release will eventually follow. "I also want to comment on my so-called 'retirement' which was posted on various sites on February 24 by the former EXCITER members. I just want to say I never said I was going to retire. In my opinion, this retirement announcement was fabricated exaggeration. What I did say is that 'I need a break from music' due to some rebellious behaviour from one of the musicians in the band. So, at this point, all that B.S. is behind me and I am now focusing on delivering some new ear-splitting, brain-rattling METAL with Dan and Allan! "I want to thank all the loyal and dedicated fans and music industry individuals that contacted me during this false retirement statement and offering their support and a positive outcome to a situation that was non-repairable. "Hope to see you soon with 'horns high and fists in the air!'" 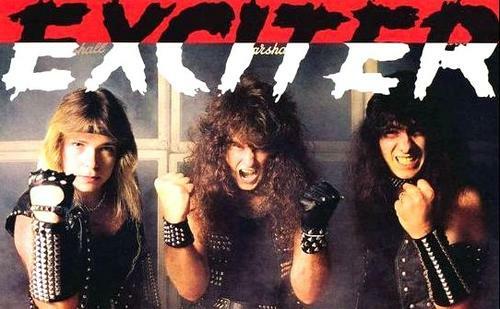 The original EXCITER lineup recorded three classic albums in the 1980s — "Heavy Metal Maniac" (1983), "Violence & Force" (1984) and "Long Live the Loud" (1985) — before Ricci left he group and was replaced by Brian McPhee. EXCITER's latest album, "Death Machine", which featured Ricci as the sole remaining original member, was released on October 29, 2010 via Massacre Records.